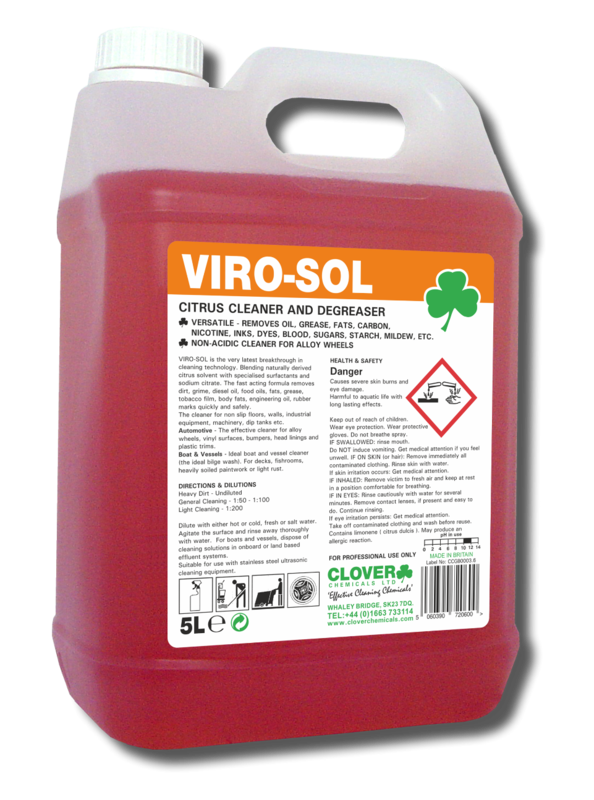 Clover Viro-Sol is a ctrus based cleaner and degreaser that has been formulated for maximum cleaning power. Manufactured with a blend of naturally derived citrus solvents, ensures it is fast-acting to remove even the most stubborn of soiling with ease. 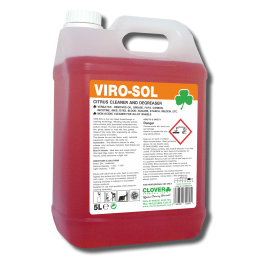 Viro-Sol is ideal for removing dirt, grime, diesel oil, mineral oils, rubber, traffic film and engineering oils, from anti-slip floors, stainless steel, machinery, equipment, vehicles, work surfaces, vinyl, painted floors, ceramic tiles, plastic surfaces and concrete. Enviro-Sol is suitable for use in schools, colleges, hotels, offices, airports, factories, shops, shopping centres, ferries, bars, nightclubs and pubs. Can be diluted with both fresh and salt water. Can be used on decks, fishrooms, heavily soiled paintwork or light rust. Fast acting and removes stubborn soiling with ease. Dilute according to the cleaning job with either hot or cold water. Apply using mop, cloth, trigger spray or scrubber drier. Agitate the surface and rinse away thoroughly with water.